The differences between actual weight and CDL License weight can confuse, even, trucking industry experts. CDL is all about the manufacturer's rating- GVWR. 26,001 pounds (GVWR) is a CDL vehicle. 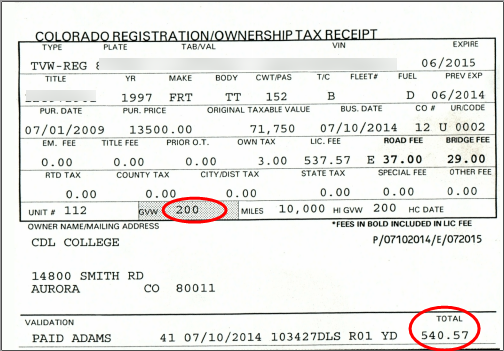 People think they need a CDL (for a particular truck) because they bought license plates (registered weight) above the 26,001 pound threshold. Take a truck that has a GVWR of 26,000 pounds. The one pound makes all the difference. The truck was manufactured at 26,000 pounds on purpose-to avoid the need for a CDL. You can't test in this 26,000 pound truck because it doesn't require a CDL in the first place. Do you know how the manufacturer determines the GVWR? GVWR is determined by the manufacturer. GVWR has everything to do with the suspension. A few tweaks to the suspension reduces (or increases) the GVWR. Weight for license plates and CDL are two different things. Truck Registration showing registered weight. This truck is a tandem axle day cab tractor. The sticker shows the GVWR of 35,000. Requires a CDL. This truck is a single axle day cab tractor. I register my school trucks at the actual weight of the truck and trailer (about 20,000 pounds). The combined GVWR (actually GCWR) of an 18 wheeler is 117,000 pounds. I don't want to buy license plates at 117,000 pounds because it's too expensive. I buy license plates at the actual weight of 20,000 pounds. I save $1500 per truck and trailer by registering them this way. I'm telling the state that I won't exceed 20,000 pounds on their roads. But, the actual weight of the truck and trailer needs to match the registration- or I'll pay a fine for being overweight. I'll get in trouble if I haul a load this truck. I wouldn't have paid enough road tax. I only registered the truck at 20,000 pounds.